Choice of marinated chicken, pork, shrimp, beef or tofu, pan-fried and served over vegetables, stir fried with oyster sauce & topped with crushed garlic and black pepper. Choice of chicken, pork, shrimp, beef or tofu, stir-fried with red and green bell peppers, yellow onions, tomatoes, cucumber & pineapple. Served with homemade sweet & sour sauce. Bite-sized grilled meat, shrimp or tofu marinated in our own teriyaki sauce and served with steamed veggies. Bite-sized chicken, pork, beef or tofu stir-fried with ginger, yellow ions, green onion and mushrooms. Seasoned with fish sauce. Can be prepared (V) vegan upon request. Choice of chicken, pork, shrimp, beef or tofu stir-fried with green and red peppers, onions, carrots and snow peas in a sweet chili & shrimp paste. Choice of minced chicken, pork, shrimp, beef or tofu, stir fried with fresh basil, Thai chilies, bamboo, green and red peppers. Seasoned with oyster sauce. Chicken sautéed with oyster sauce, cashew nuts, red and green peppers, onions and roasted chilies. Choice of chicken, pork, shrimp, beef or tofu stir-fried with fresh green beans, kaffir leaves, red curry paste & fish sauce. Battered and deep fried veggies with choice of meat, tofu or shrimp. Topped with sweet and sour sauce. Choice of chicken, pork, shrimp, beef or tofu stir-fried with fresh asparagus, green and red peppers, yellow onion and oyster sauce. Choice of chicken, pork, shrimp, beef or tofu cooked with red curry paste, coconut milk, bamboo shoots, peas, Japanese eggplant and fish sauce. Choice of chicken, pork, shrimp, beef or tofu cooked with green curry paste, coconut milk, bamboo shoots, peas, Japanese eggplant and fish sauce. Choice of chicken, pork, shrimp, beef or tofu cooked with red curry, squash, bamboo shoots, basil, green beans, zucchini, carrots and fish sauce. Choice of chicken, pork, shrimp, beef or tofu cooked with Mas-Sa-Man curry paste, coconut milk, potatoes, peanuts, pineapple chunks & fish sauce. Choice of meat or tofu cooked with yellow curry paste coconut milk and cubed potatoes. Choice of chicken, pork, shrimp, beef or tofu cooked with Pa-Nang curry paste, coconut milk, peanuts, carrots and fish sauce. Marinated chicken cooked with red curry paste, coconut milk, ground peanuts and fish sauce. Choice of chicken, pork, shrimp, beef or tofu cooked with red curry paste, coconut milk, fish sauce, red and green bell peppers, kaffir lime leaves and fresh pineapple. Choice of chicken, pork, beef or tofu stir-fried with red curry paste, red and green bell peppers, onion, green beans and fish sauce. Topped with chopped kaffir lime leaves and lemon grass. Medium tiger shrimp or tofu stir fried with yellow curry paste, coconut milk, snow peas, green and red peppers, bamboo shoots, yellow onion and basil. Shrimp stir-fried in red curry paste with coconut milk, red and green bell peppers, bamboo shoots and kaffir lime leaves. Catfish coked with red curry, coconut milk, red and green bell peppers, bamboo shoots and onions. Topped with chopped kaffir lime leaves. Tempura battered tilapia filet topped with jullian red and green bell peppers, carrots and topped with red curry coconut sauce. Garnished with shredded kaffir lime leaves. Bite-sized stir-fried beef marinated in oyster sauce with broccoli, green onion, yellow onion and mushrooms. Thai-style hot and sour soup with lemon grass, kaffir lime leaves, galanga, Thai chilies, lime juice and mushrooms. Choice of chicken, pork, beef or shrimp. Thai-style hot and sour soup with coconut milk, lemon grass, kaffir lime leaves, galanga, Thai chilies, lime juice and mushrooms. Choice of chicken, pork, beef or shrimp. Pan-fried rice noodles with choice of chicken, pork, shrimp, beef or tofu with our own Pad Thai sauce. Mixed with bean sprouts and green onions, topped with cilantro, ground peanuts and lime. Pan-fried rice noodles with choice of chicken, pork, shrimp, beef or tofu, mixed with broccoli and sweet dark soy sauce. Rice noodles stir-fried with choice of minced chicken, pork, shrimp, beef or tofu, with red and green bell peppers, mushrooms, bamboo shoots and fresh basil leaves. Seasoned with oyster and sweet soy sauce. Steamed rice topped with bite-sized chicken breast, sautéed with mushrooms, bamboo shoots, shredded carrots, green onions and oyster sauce. Garnished with Chinese sausage and cilantro. Choice of chicken, pork, shrimp, beef or tofu with onions, diced carrots and peas. Garnished with cucumber and cilantro. Seasoned with fish sauce and ketchup. Pan-fried rice with choice of chicken, pork, shrimp, beef or tofu, red curry paste, diced carrots, peas, yellow onion and red and green peppers. Six chicken skewers, marinated in a mixture of herbs and spices. 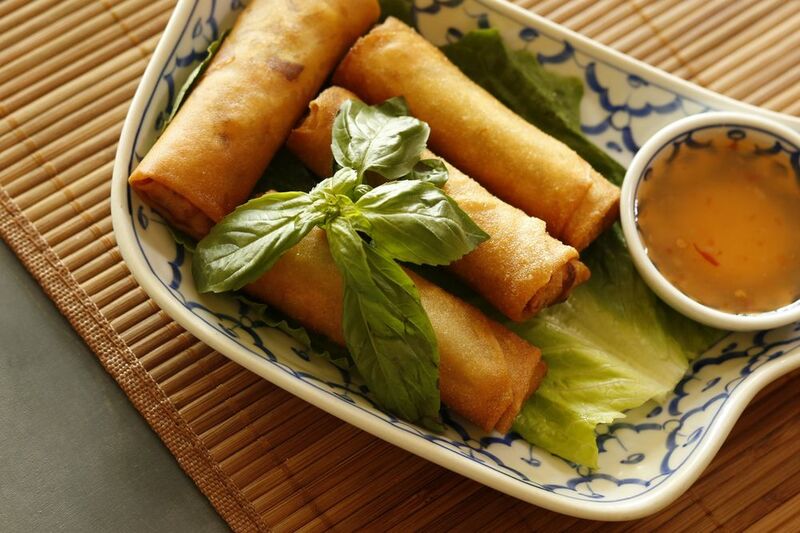 Served with our homemade peanut sauce and cucumber salad. Four egg rolls filled with chicken, bean thread noodles and vegetables. Served with our own sweet and sour sauce. Vegetarian option available upon request. Four steamed dumplings filled with seasoned chicken, green onions and vegetables. Served with our own pot sticker sauce. Six wontons filled with seasoned chicken, shrimp, bamboo shoots and carrots. Served with our own sweet and sour sauce. Six deep-fried shrimp wontons served with our own sweet and sour sauce w/ ground peanuts. Deep-fried tofu served with our own sweet and sour sauce and ground peanuts. Six bite-sized steamed wontons filled with ground pork, shrimp, water chestnuts, bamboo shoots and lotus seed. Served with homemade pot sticker sauce. Fresh beans cooked to perfection. Sautéed with oyster sauce, soy sauce, sugar and sesame oil. Shredded carrots, ground peanuts and tomatoes. Seasoned with Thai chilies, lime juice and fish sauce. Thin slices of grilled beef mixed with cucumber, tomatoes, onions and cilantro seasoned with Thai chilies, lime juice and fish sauce. Bean thread noodles mixed with ground chicken, shrimp, onions, tomato and cilantro. Seasoned with Thai chilies, lime juice & fish sauce. Your choice of minced chicken, pork or beef mixed with ground rice, onions, mint leaves and fresh ginger. Seasoned with Thai chilies, lime juice and fish sauce. Rice Mixed with red curry paste, deep fried and tossed with onion, ginger, limes, peanuts, roasted red peppers and fish sauce. Steamed chicken, veggies & noodles or rice. Black sticky rice with sugar, topped with coconut milk.